We have received a few questions about choosing an order for songs during different sections of the wedding. How does one choose specific songs for prelude, postlude, and cocktail hour? There is two basic options for preludes. One could order the pieces to build slowly, with the processional as the final climactic moment. One could alternatively place slower pieces nearer the end to make the processional “pop” in context. When mixing genres, as many people do for their cocktail hour, one can either group the classical and popular selections together or alternate between different styles throughout. Most couples pick two processional pieces: one for the bridal party and one for the bride. 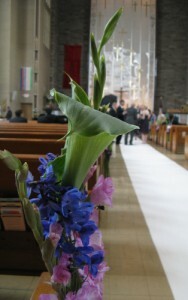 Some couples also request a special song to be played at the end of the prelude as family members and the groom enter. Still others request only one piece for the entirety of the processional. If you have more than one reading, many couples choose to have a short, musical reflection between them. You may also choose to have two (or more) musical reflections before and after readings as Carli and Tom chose to do. You may choose as much or little music as you want for your event. We have played at weddings where the bride wants us to pick all her music! Sometimes couples will choose everything that is played from the beginning of the prelude to the end of the cocktail hour. If you know just what kind of mood or style you would like to set, we have a lot of experience putting together playlists for our clients. Making a “Do Not Play” list for your musicians is perfectly acceptable. Our ensemble has plenty of music from which to choose. We would have plenty to choose from, even if half of it was eliminated. There is sometimes wedding music that we only play by request because its usage is so personal. A particular case would be Wagner’s Bridal Chorus. Some couples love it for its time-honored character. Still others want something further outside the box. If you wish to combine classical and pop genres, many couples choose to start their wedding ceremony with classical music and move to pop selections at the recessional/postlude or for the cocktail hour. If you do not know what pieces you would like but have a specific style in mind, we are always very willing to pick out appropriate wedding music. In addition to specifically requesting Canon in D, Nicole and Timothy requested celebratory classical music for their prelude, so we picked the rest of their prelude selections based on that criteria. We are continually arranging music to add to our repertoire lists, often writing about new arrangements on our blog. We have over 400 titles in our continually-expanding repertoire list which is in easy-to-search (PDF) format. Our list is sectioned by genre for you to mix-and-match and includes: Classical (from all time periods and including popular opera titles), Folk Tunes, Waltzes, Broadway/Film/TV, Ragtime, Latin/Tango, Jazz/Swing, Pop/Rock/R&B/Crossover, Religious (Jewish and Catholic/Protestant), and Christmas Music. Don’t see your favorite song on our list? We are always willing to put together an arrangement! The older a piece of music is, the more likely we will be to find it for free. For example, we found a free, legal copy of the third movement of Scheherazade for Alicia online. We were then able to put together a quartet version free of charge. You do not need to have finalized your wedding ceremony music before signing a contract with our ensemble. We ask that you request any extra music selections at least four weeks before your wedding. All other selections are due two weeks before your wedding. It is typical for us to be in contact with a number of your vendors before your wedding day. For a typical wedding we may be in contact with the singer, pastor, church music director, day-of wedding coordinator, as well as the bride, in order to ensure that things move as smoothly as possible. We specialize in string ensemble music, but sometimes a couple arranges to have another instrumentalist or singer in their wedding. In those cases, we often arrange an extra rehearsal before the wedding so everything goes smoothly. We also stay in contact with the musician(s) leading up to the wedding. In order to make transitions between parts of your wedding smooth, we adjust the length of your processional and ceremony music so it lasts just the right amount of time. As an example, we played “Lullaby” until Amanda and Jeff finished lighting the unity candles and were back in their places, ready to proceed with the ceremony. Grooms are just as good at planning wedding details as brides and parents. If you are feeling overwhelmed as the bride-to-be, let your groom pick up some of the wedding music organizing responsibilities. The string trio is a great option for our more budget-conscious couples. Our quartet repertoire is the most robust, but we can often adapt quartet arrangements for trio. We did this for Andrea and Jason with “Fields of Gold”.